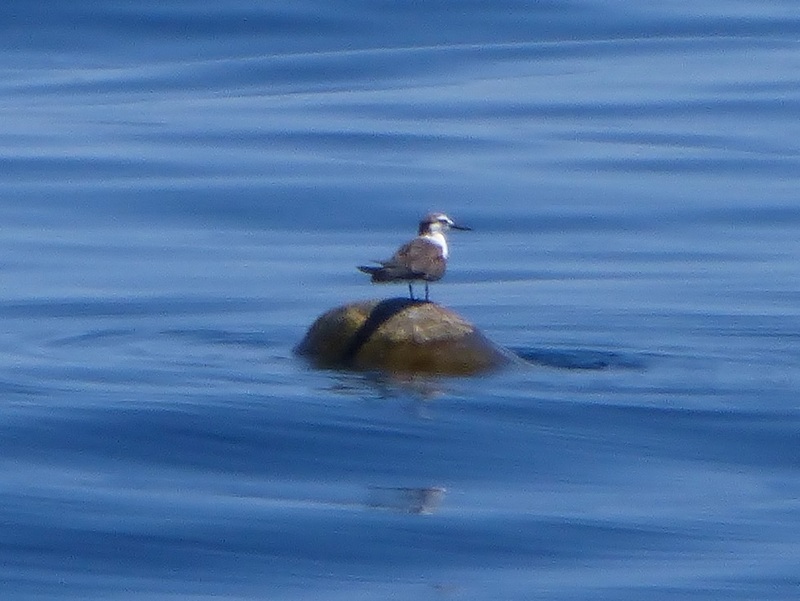 During the three day / two night passage from Banderas Bay on mainland Mexico to Bahia los Frailes on the South East tip of Baja, we had less wind and smaller waves than any day we spent anchored in Banderas. Some sailors will whine about the lack of sailability, but not us. Run the motor, have a nice peaceful trip, nothing gets broken. Perfect. We left Punta de Mita way before dawn Sunday morning. We should have waited an hour so we could see the fishing nets that crosses the opening to the bay, but we made it out without trouble. If we had left later, we would have missed the light show. The ocean was spectacularly full of bioluminescence, and swirling whales or spawning fish or cresting waves were lighting up huge areas of the ocean. 100 foot square patches would suddenly turn bright greenish-white, then slowly fade. It was surreal. Dolphin were swimming back and forth under the boat, trailing bright sparkles, and leaping higher than the decks, dragging their glowing trails with them through the air. Once we got clear of the land breezes and the sun came up, more normal miracles followed. 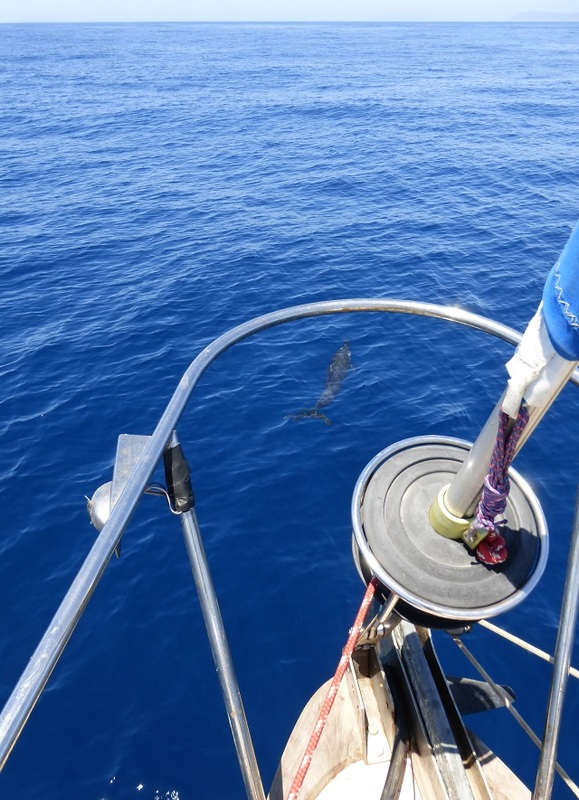 Dolphins appeared to check us out of the mainland, then again to check us into Baja. 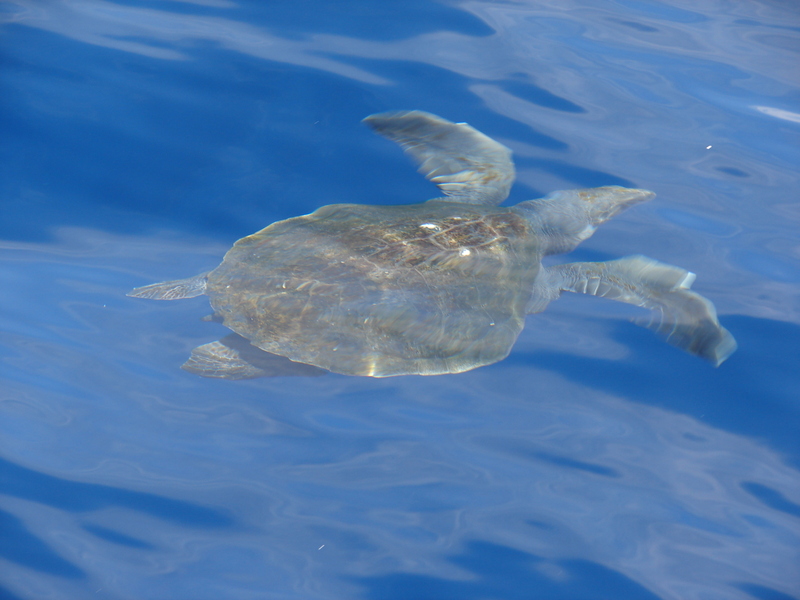 The ocean was completely full of turtles and their birds. 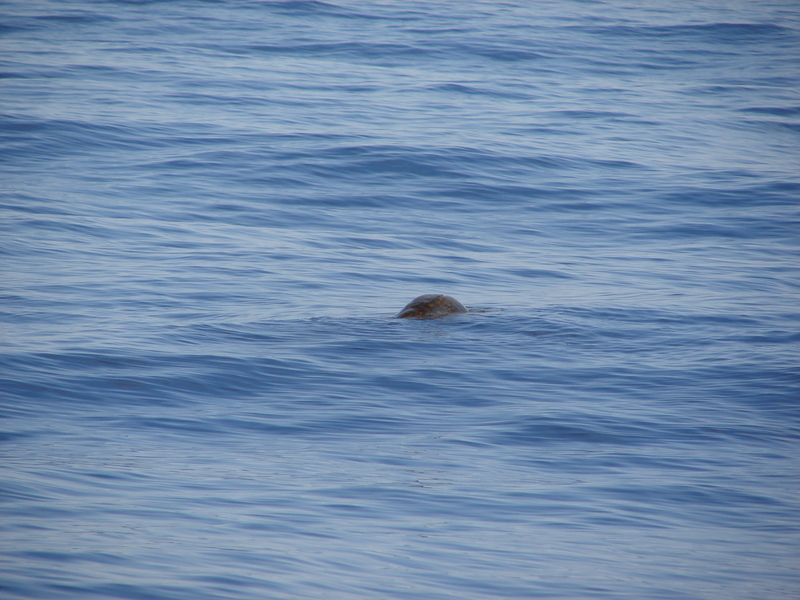 There weren’t too many sea lions, but there were enough to keep things interesting. The sun came up every morning, and set again each evening. Nancy saw a spectacular green flash the first night. There are no pictures. 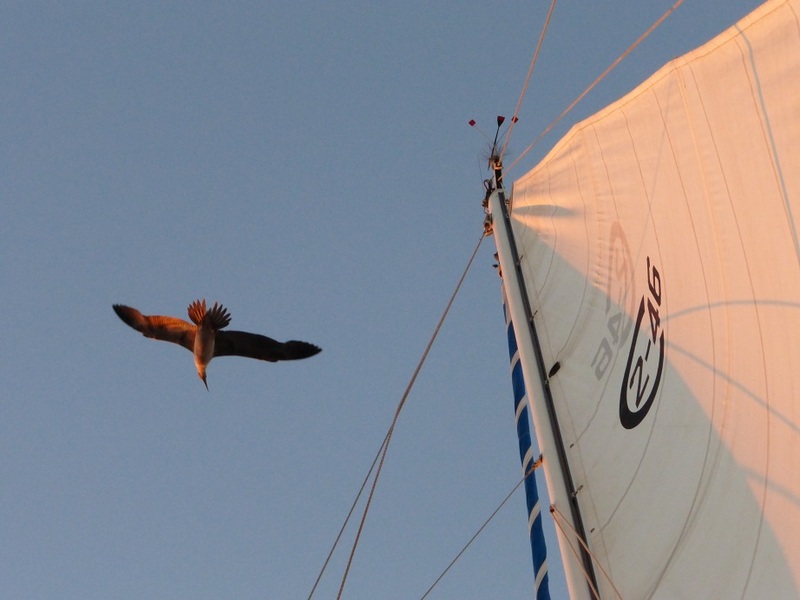 Two boobies rode the bow wave off our sail the second night. Thankfully they didn’t find a place to land. The sail was full of wind because the motor was running. Our five knots (over the water and through the air) plus the wind’s three knots gave us enough wind to barely fill the sail and stabilize our rolling. If we turned off the motor we would have been drifting. I did some reading. Book reports to follow. Run away. 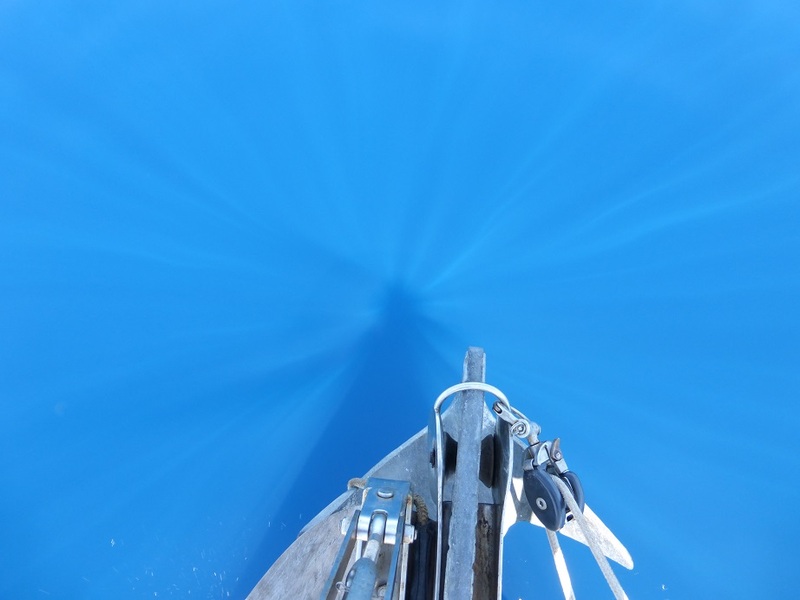 This is what you see when you look into very clear, calm water with the sun directly behind your head. It’s cooler in person, because the white “rays” dance. When we’re sailing, we try and monitor VHF channel 16 to listen for conversational hailing and emergency calls. It’s a problem in many parts of Mexico, because there’s lots and lots of yammering and singing and playing music and whistling and blah blah blah. 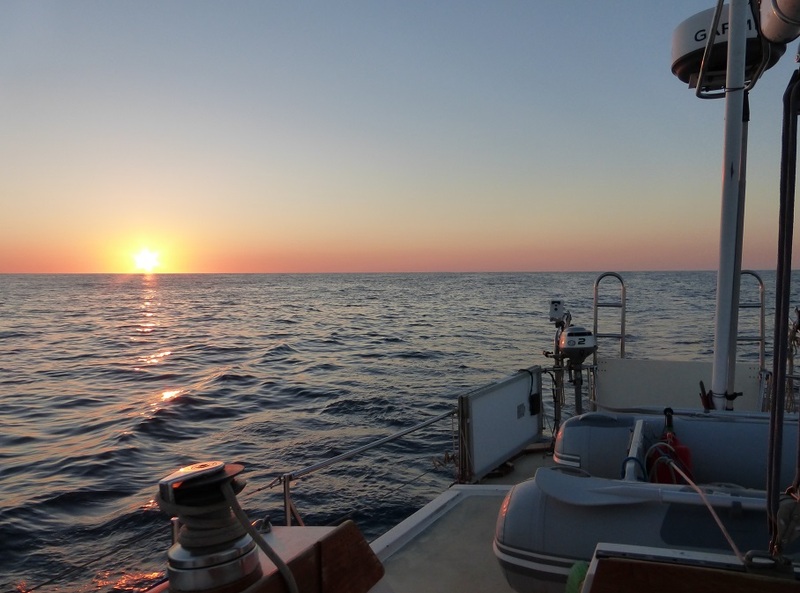 At dusk last night, well after we had anchored, I had just given up on the radio and was literally reaching for the “off” knob when I heard the word “Tsunami” break through the barking. I logged onto the internet and spent the next three hours watching the Chilean earthquake turn into a Tsunami advisory, then a warning, almost a watch, and then have the whole thing cancelled as a wide-spread Tsunami failed to materialize. Most everyone else didn’t know anything about it and spent their evening in relaxed conversation or other productive behavior. 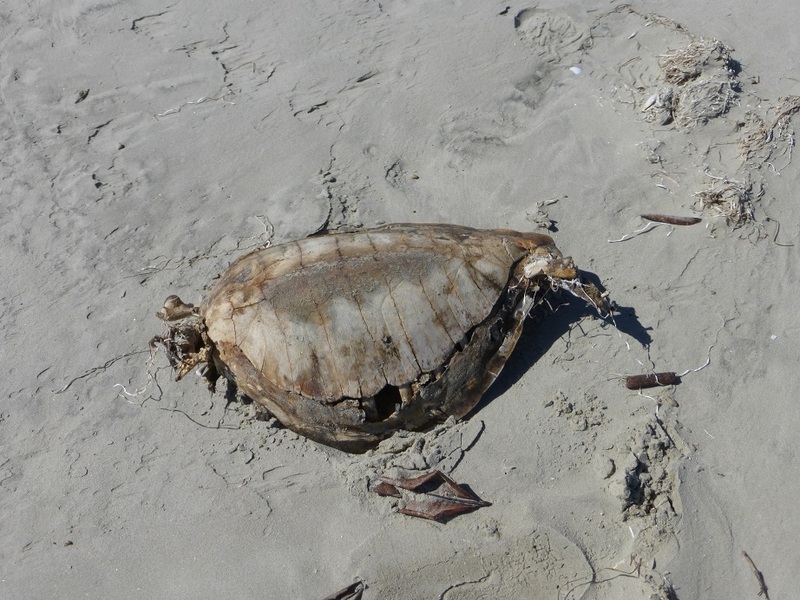 And so it goes…..
All over the world, poor people and shrimpers have been killing turtles like nobody’s business. The current state-of-the-art is to get the shrimpers to pretend they’re not killing turtles, and to get the poor people to see turtles as a cool thing, not just easy prey. Also, there is an emphasis on making turtle egg-laying more productive by keeping the beaches wild and by limiting lighting on and behind the beaches. 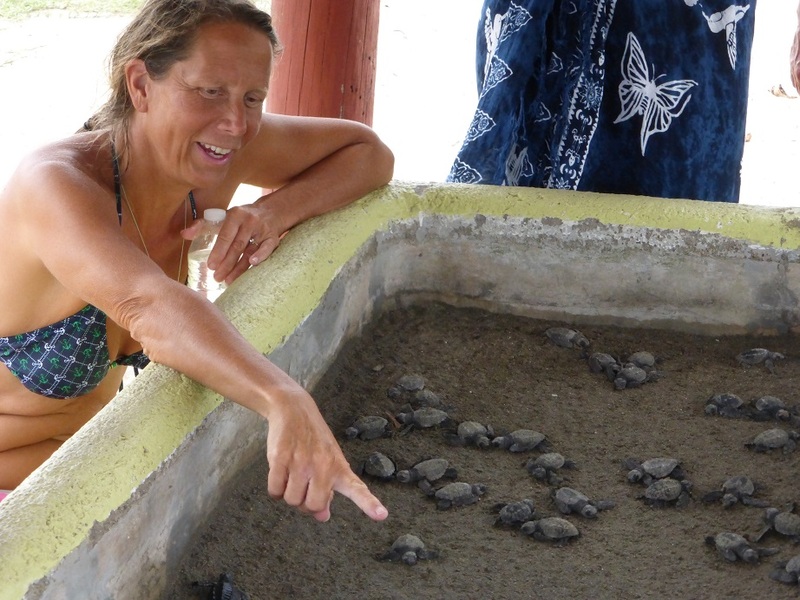 Often, conservation groups patrol the beaches every morning, dig up the nests from the night before, collect the eggs, then try and get as many of the baby turtles into the water. They often involve local school kids in the turtle releases to motivate them to get their parents to stop making turtle soup. 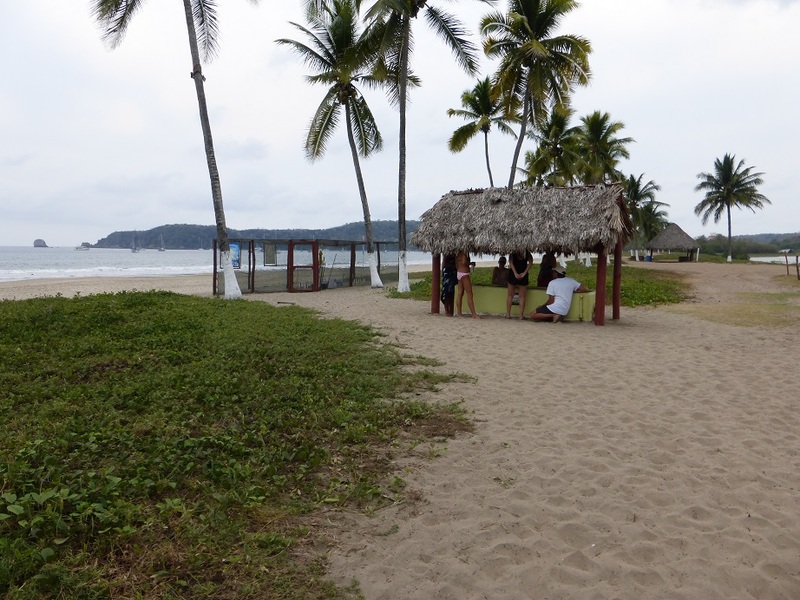 Here is the setup at the beach-front hotel here in Tenecatita. The anchorage is in the distance, inside the hook of land. If they find a nest on the beach, they dig it up and transfer the eggs to inside the chain-link fence. They label the clutch with date found, number of eggs, and estimated hatch date based on 45 days cook time. There were two nests over a week overdue, so we checked every day knowing a hatch was near. 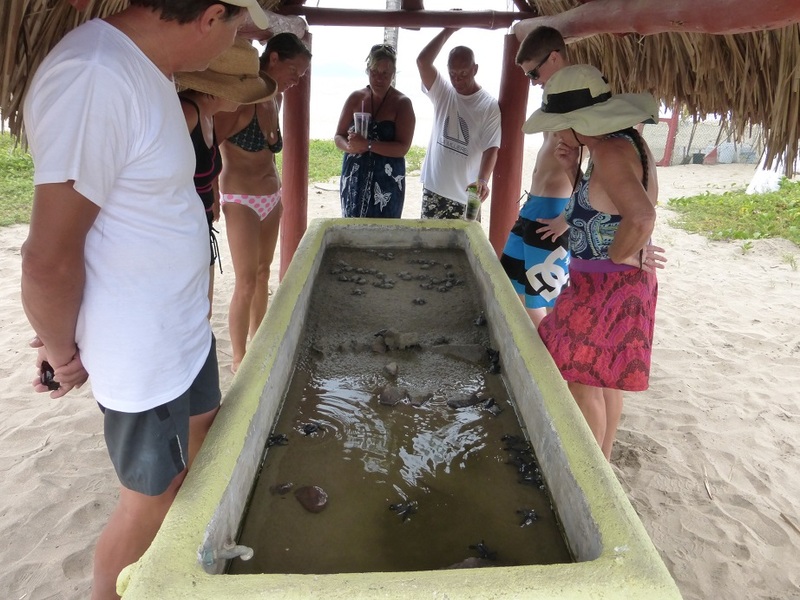 Under the thatch roof is a tiny fake beach, where they hold the new turtles until the evening. 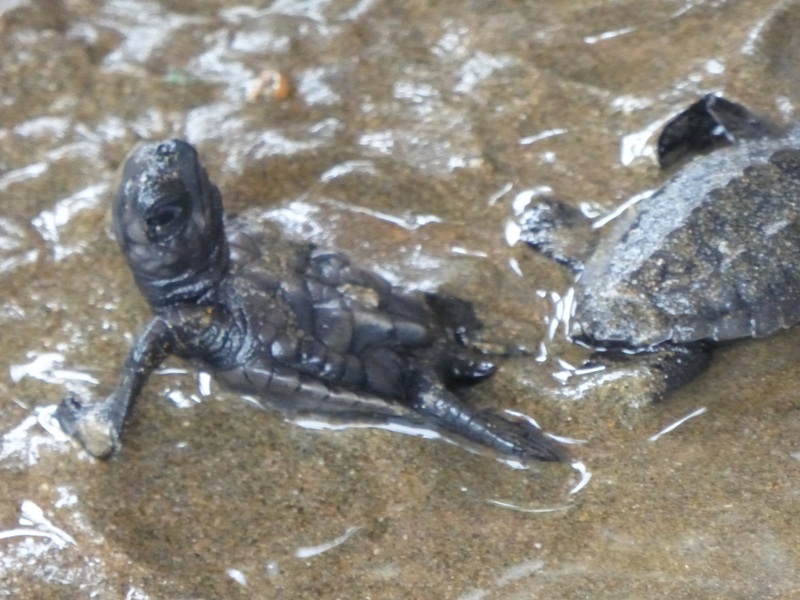 People come from all over the world to see the baby turtles and become happy. Somehow, in their short lives, these turtles have already learned a few entertaining tricks. “Roll Over!” seems to be a favorite. 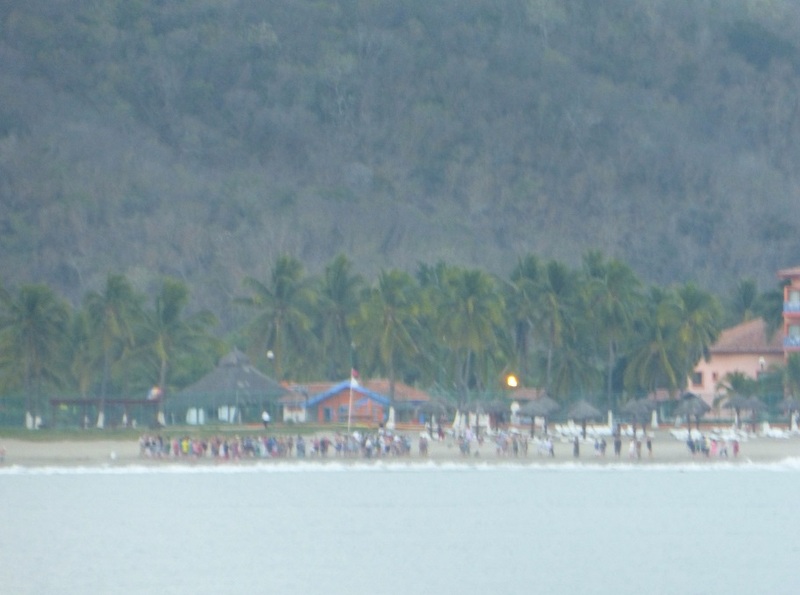 People show up on the beach at dusk to release the turtles into the Pacific Ocean. This evening there were approximately five foot waves breaking on the beach. Good thing the turtles have such hard shells. Actually, it wouldn’t surprise me if the waves help by confusing the environment for predators, at least for the first few feet. 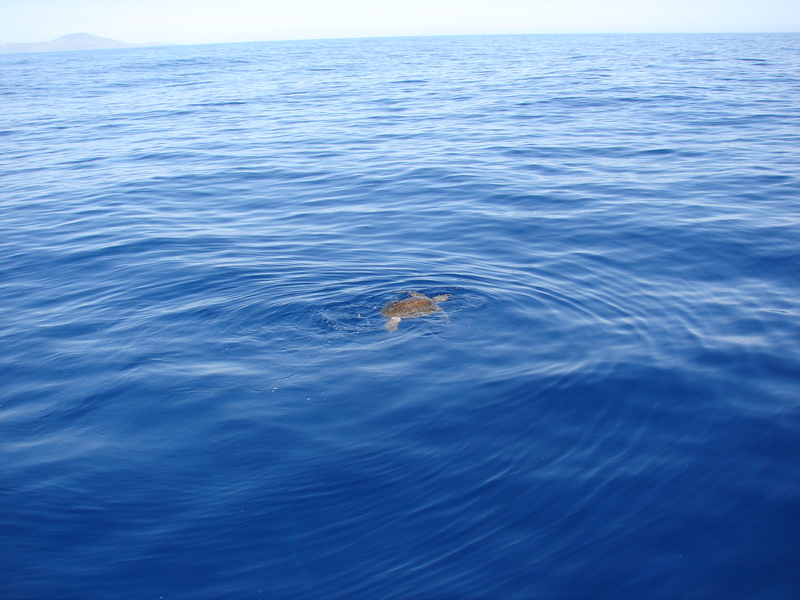 There are a lot of dead turtles here in Magdalena Bay and in the adjacent Bahia Santa Maria. Dunno why. Maybe the shrimpers. They kill everything. Maybe the tuna seiners. 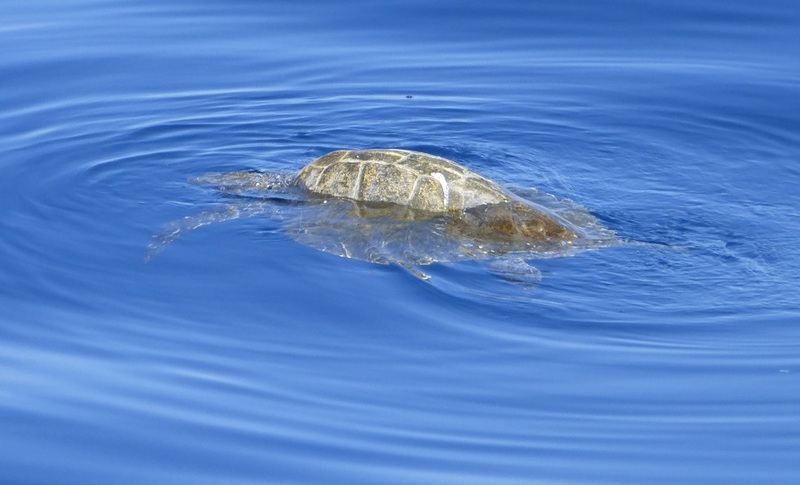 There’s lots of tuna seiners here, and lots of turtles. Bound to be trouble. We discussed the excellently thought-out turtle construction scheme earlier. 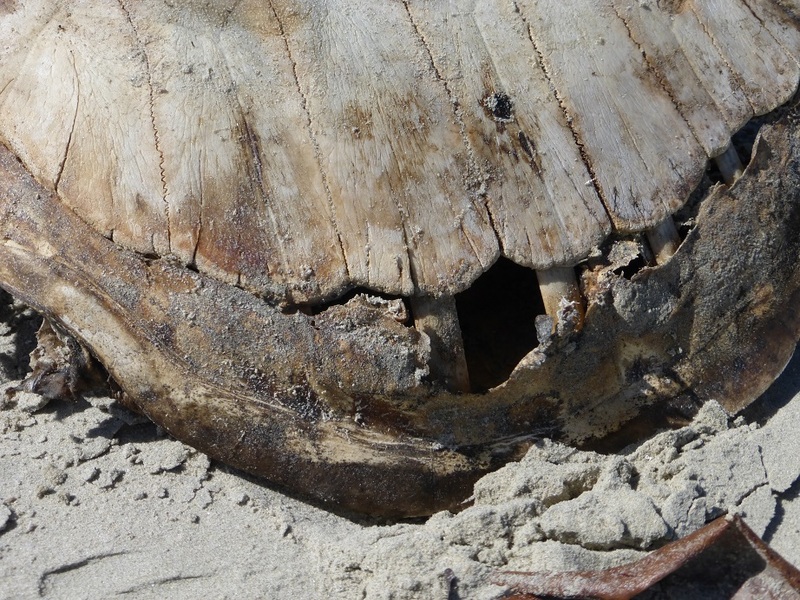 In the comment section, Pender raised the possibility of a skin over the shell, but we hadn’t seen that yet. Here is a dead turtle. The less interesting parts (from an engineering perspective) have been removed by a TA. In close-up, we can clearly see the compression bone/ribs acting as the spokes in the wheel, and the roundular tension “tire” completing the structure. We can also see some lingering tissue binding the two together. 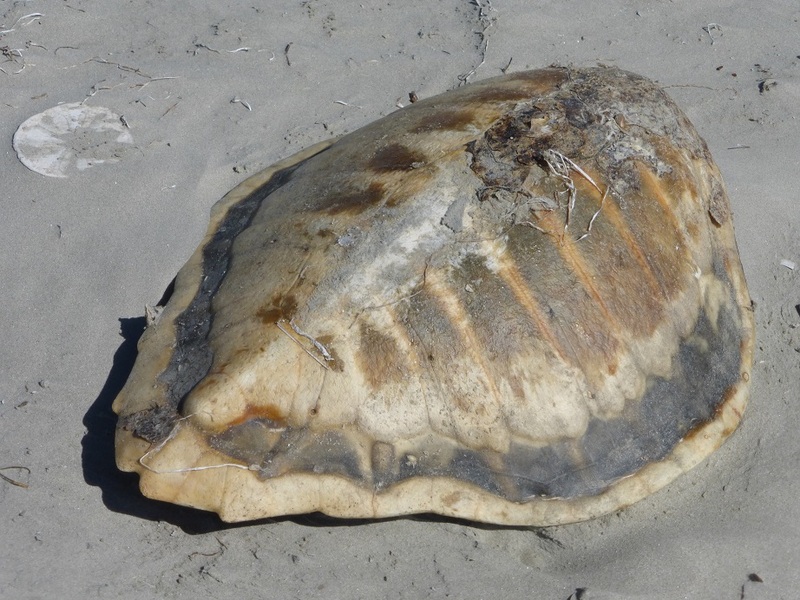 In this more recent mort, we can see that there is indeed a leather or membrane covering the entire shell, and that a tougher material (ligament, perhaps?) not only binds the tire to the spokes, but I’m sure also provides the flexibility required for effective oceanic maneuvering. Pender is vindicated. However, here’s a remaining puzzle. 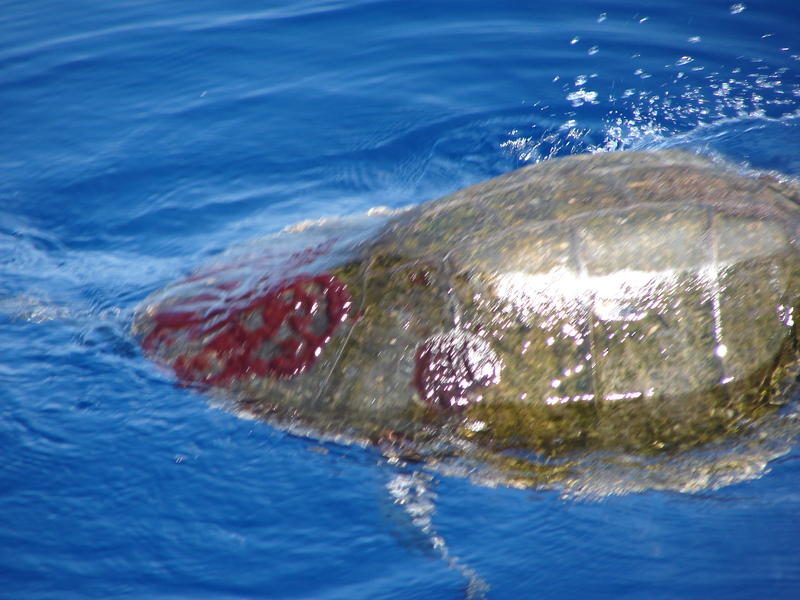 Turtle shells are prized as ornaments, but the color and sheen comes completely from a skin that quickly degrades. Are decorative turtle shells painted by mischievous malfeasants? More research is required. The water yesterday was very bumpy for being almost totally wind-less. Looks like a shrimp pot float. Of course, it is 1200 feet deep. Oh, look. Turtles! All the way down. If you pass them at 10′, they don’t move. If you pass them at nine feet, they panic. This one decided his best option was to swim in front of the boat. This big one didn’t look to good. Ulcers or gunshot wounds. Dunno. He still managed to matriculate down the ocean, though. I suppose it’s pretty easy to chase down jellyfish at night.